Any conversation about money is often stressful. Too often, it’s stressful because the conversation is about the lack of funds, dinero, moolah, case, money, or whatever you call it. It’s never about the overabundance of money. Because the biggest vacation planning day of the year (1st work day after Christmas Break) is quickly approaching, I think now is a great time to talk about budgeting and financial confidence. It’s something we can ALL have if we set our minds to achieve it. Financial security and confidence doesn’t come naturally for everyone. When I look back to when I was in college and first married, I didn’t know how to balance a check book. I honestly thought if my bank account showed a positive balance then I could buy without checking to see if other expenses had cleared. It was really sad and a little (more like a lot) painful. Now that I have kids, I want them to have a MUCH better understanding of money. I am striving to ensure that they understand money, learn how to budget for what they want, know the difference between a want and a need, investing, and credit, etc. As I look ahead to the new year, my husband and I are getting our children more involved in travel planning and budgeting. They are already invested in helping to plan out vacations and weekend trips, so this is a natural progression for us. I don’t want them to make the same mistakes I did in college. Luckily, SunTrust’s onUp Challenge is a great place to start. For over two years, their onUp Movement has helped so many achieve financial confidence. No matter what your goals are for the new year, this challenge is a fun and informative experience that can help you too! Talking about money shouldn’t be painful or feel like a chore. I want to talk with my children honestly and feel comfortable with discussing money. The Challenge makes this task light hearted and easy to do by starting with a simple Values Challenge. It asks a series of questions to understand your goals and values. Afterwards it provides guided help through 7 Magical Lands. As you explore these lands, you get financial advice, useful tips, strategic tools, and challenges for you to accomplish. Special Mind Map Activities challenge you to reach your goal. The onUp Challenge is not for children, but financial confidence is something everyone should have. I should note here that my children are now 10-15. My children and I are exploring the “lands”—reading and learning together. Then, we often talk about it together. Often we’ll chat around the dinner table and that will help all of us be more confident in our financial situation. 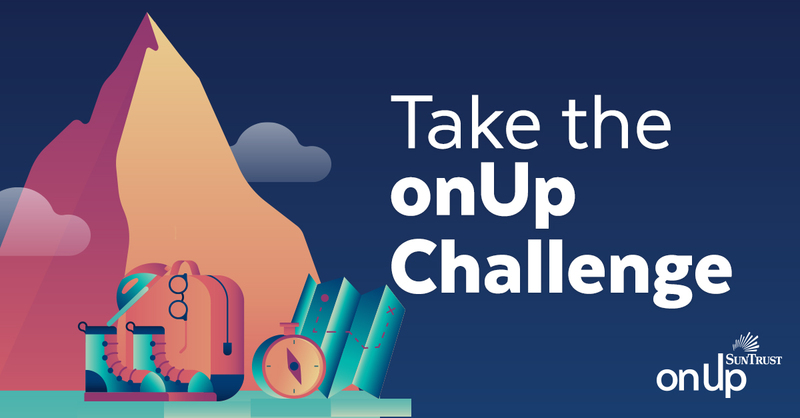 Regardless of your financial goal, the onUp Challenge helps you create a checklist of actionable items to achieve those goals. It could be a new home, a six month emergency fund (we’re working on this one now), or a month long vacation. Take the onUp Challenge and get started on your journey to financial confidence too.